The marathon training pace you should choose should be whatever is comfortable for you and allows you to complete each training run. After beginning to run, you may find that you were born to run. You may also find that running is enjoyable and fun, but does not come easy. The pace you choose should allow you to complete your training runs which will lead to achieving your goal. Do not set a time goal. Let me say that again. Do not set a time goal! At the most, think, “it would be nice to run” under a specific time. Why the heck would I not want to set a time goal? I know, I struggled with that idea as well, but here is why: Your goal is to successfully train for and finish a marathon or half marathon. As a non-runner, or even a veteran runner, you dramatically increase the likelihood of injury by demanding a set time during your training runs and the marathon or half marathon run. If you push yourself too much, then you may not even make it to the starting line on the big day, much less achieve your goal. What if you have a time goal and finish the race, but do not hit your time goal? How will you feel? Will you feel you have accomplished anything? Finishing a marathon or half marathon is an incredible feat that very, very few people in the world can say they have accomplished. Remember your goal. 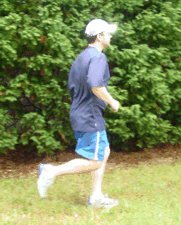 Run at a pace comfortable to you and that allows you to finish your runs. To figure your pace time, use the Racing Buddy Pace Calculator. Want to learn more? Marathon Rookie: How to Train for a Marathon...and have fun doing it! and Half Marathon Rookie: How to Train for a Half Marathon...and have fun doing it! are both fun to digest, inspiring books that teaches you everything you need to know to enjoy training and cross the finish line for the first time.